Vehicle stability control, Variable-assist pwr rack & pinion steering, Tire pressure monitor system, Tilt & telescopic steering wheel, Sun visors w/front passenger vanity mirror, Side-door impact door beams, Rear leaf-spring suspension w/staggered outboard-mounted gas shock absorbers, Rear door child safety locks, Rear bulkhead storage, Pwr windows. This Toyota Tacoma has a dependable Gas V6 4.0L/241 engine powering this Automatic transmission. Pwr ventilated front disc & rear drum w/rear tandem booster brakes, Pwr mirrors, Pwr door locks, P245/75R16 mud & snow tires, Overhead console -inc: maplights, sunglasses storage, Multi-reflector halogen headlamps, LATCH lower & top tether anchors for front passenger seat & all rear seats, Gauges -inc: LCD display, tachometer, coolant temp, fuel level, tripmeter, digital clock, Full-size spare tire, Full carpeting, Front sport seats -inc: sport fabric trim, 4-way adjustable front seats, driver pwr lumbar support, front passenger fold flat seat, active headrests, Front & rear stabilizer bars, Front & rear side curtain airbags, Front & rear mudguards, Fiber-reinforced sheet-molded composite bed -inc: steel outer panels, storage compartments, rail caps, removable tailgate, Engine immobilizer, Engine & front skid plates, Electronic brake-force distribution, Dual 12V aux pwr outlets, Driver & front passenger seat-mounted side airbags. ALG Best Residual Value, KBB.com Best Resale Value Awards. 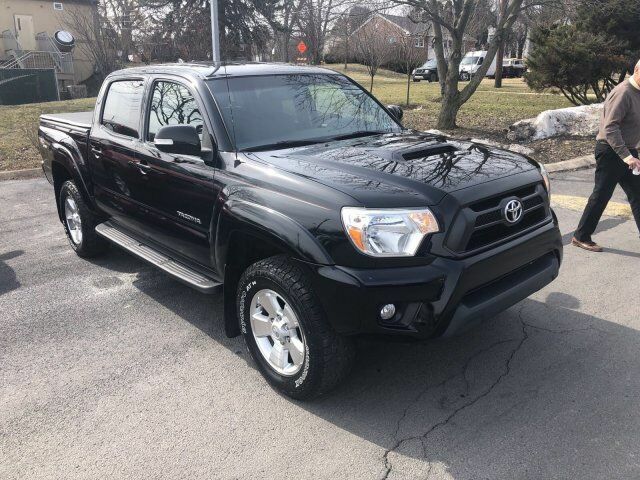 As reported by KBB.com: If you're looking for a proven pickup that is as capable as it is stylish, the 2012 Toyota Tacoma pickup deserves your full attention. Nearly as capable as a full-size pickup, but without the extra bulk or poor fuel economy, the Tacoma offers a wide selection ranging from everyday work truck to rugged off-road adventurer. For a must-own Toyota Tacoma come see us at Joel Confer Toyota, 120 E Clinton Ave, State College, PA 16803. Just minutes away!